Okay, you have to prepare yourself for this one. 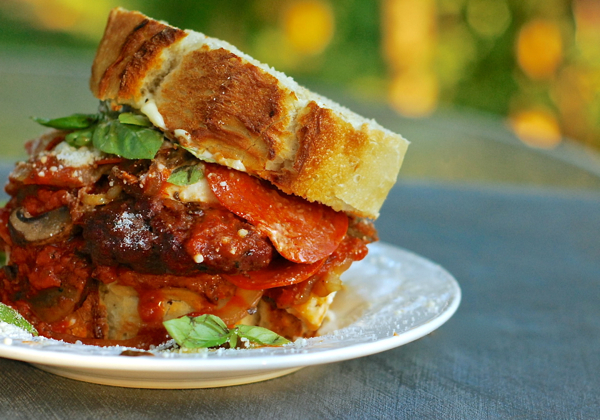 It’s truly magnificent and reminiscent of what my Italian grandma, Darling, calls a “Hot Dago Sandwich.” If you like meatballs, and you LOVE Italian, you’re going to go bonkers over this burger. In a skillet, saute the mushrooms and onion in the butter until tender and slightly sticky, and the mushrooms have reabsorbed their juices. Deglaze pan with the wine and cook just until the mushrooms have reabsorbed the liquid a second time.